If you would like a gift tag with your item. Please, leave the 'exact' text you would like in the comments section at checkout. This beautiful Engelsrufer Hearts pendant from the Engelsrufer Angel Whisperer collection offers beautiful details. The design is formed by lovely hearts. The Engelsrufer's crown is decorated by a white synthetic zirconia. 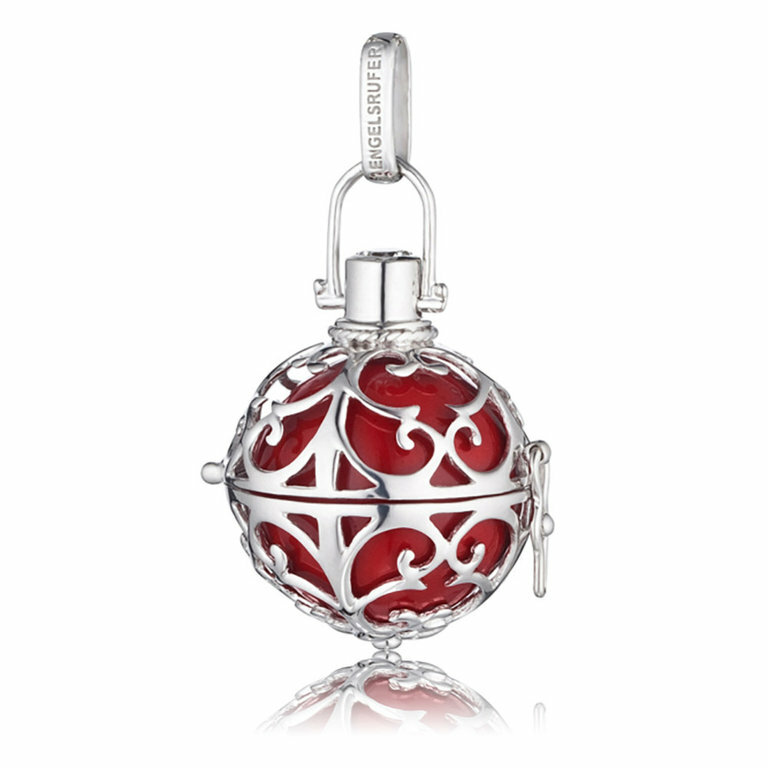 This pendant includes a red sound ball which stands for strength, fire, passion, and love. Red is a magic colour full of power and vibrations which you can feel directly in your body. It is possible to change the sound ball by opening the clasp. The hearts pendant is quality handmade in 925 sterling silver. To protect it against tarnishing and for the wearing comfort it has a rhodium-plated surface. We offer Free Standard Uk Delivery for all Jewellery and Watch purchases. Purchases are usually received within 3-5 days. If you need your item quicker we offer 1st class (usually within 3 days) and special delivery (next day) options at an additional charge. All homeware items have a small delivery charge and are usually despatched within 1-2days. We will send you a confirmation email to advise when you should receive your item. Items usually take between 3 - 5days. Bogues Jewellers also offer Free Click & Collect at both our stores in Omagh and Enniskillen. To avail of our Click & Collect service - simply purchase your product online and choose your preferred location for collection at checkout. Most items are available for next day collection although some can take up to 7 days. However, you will receive an email to confirm that your order is ready for collection. Then simply call in-store at a time that suits you to collect your item. Please, bring along 'valid identification' and your 'order confirmation' to successfully pick up your item. If you wish to return your item - you can return the item to your local store for a full refund. Please see our 'Returns Policy' for more information. We have a dedicated Internet team that deals with all our orders. Items in stock will be shipped immediately. Handmade items may take up to 28 days to manufacture. We will advise you of the expected delivery time for any of your orders. You should expect to receive your order within 3 business days (UK) . International orders are generally received within 3-5days. You will receive a tracking number (Royal Mail) which will help you track your parcel. At Bogues Jewellers we believe that jewellery is the “ultimate gift” and to help make that gift extra special - we are now offering free gift wrap across all our items. To receive your item gift wrapped - simply 'tick' the required box stating 'Gift Wrap my item' and we will take care of ensuring that your gift comes in high quality wrapping paper.For that extra special touch - If you would like a gift tag with your item you can leave the 'exact text' you would like in the comments section at checkout and we will then add this text on to a gift tag and attach this to your gift wrapped item all for free. Bogues Jewellers will email you with a reference number for your purchase. Use the orders/tracking option on our website to confirm the progress of your delivery. Please note that international customers must use a different link which is clearly shown on the page. Any outstanding queries should be directed to info@boguesjewellers.com. We are committed to your satisfaction with our service and our products. If you are not satisfied with your purchase, return the item in pristine condition in the original packing within 14 days and we will refund your payment in full. Please note - In the interest of hygiene and for your protection we do not accept returns or refunds on, pierced earrings. Please note that certain items cannot be returned unless Bogues Jewellers is at fault.These are personalised or engraved items. Or items that have been made specially for you, and which are made to the specification of your order, we are unable to offer a refund or credit note, so please be sure before you order. If you have any query, please contact us at info@boguesjewellers.com. Engelsrufer handcrafted rose coloured sound ball trimmed all over with sparkling crystal stones in two colours. This chain from the Engelsrufer Angel Whisperer collection is a discreetly and filigree chain that will emphasize your pendant. The uncomplicated carabiner closure guarantees an easy opening and closing. This chain is made of 925 sterling silver 18K rose plated. This gold plated Engelsrufer Ankerkette is suitable for every pendant of the Engelsrufer collection. The bigger chain links make it possible to adjust the chain a bit in its length, just put the carabiner in any chain link and adapt the length marginally according to your wishes. The uncomplicated carabiner closure guarantees an easy opening and closing. This chain is made of 925 sterling silver 18K gold plated.